Traditional rendering of "tukkiyyim," mentioned among the creatures brought by Solomon's ships from Tarshish (I Kings x. 22). The peacock is an Indian bird (comp. the Malabar "togai" and the Tamil "tokei" for the "tail" of the peacock; A. V. renders "renanim," Job xxxix. 13, by "peacock"; but see Ostrich). The Talmud uses the term (comp. the Greek ταός), and forbids the crossing of the peacock with the hen (B. Ḳ 55a). From Shab. 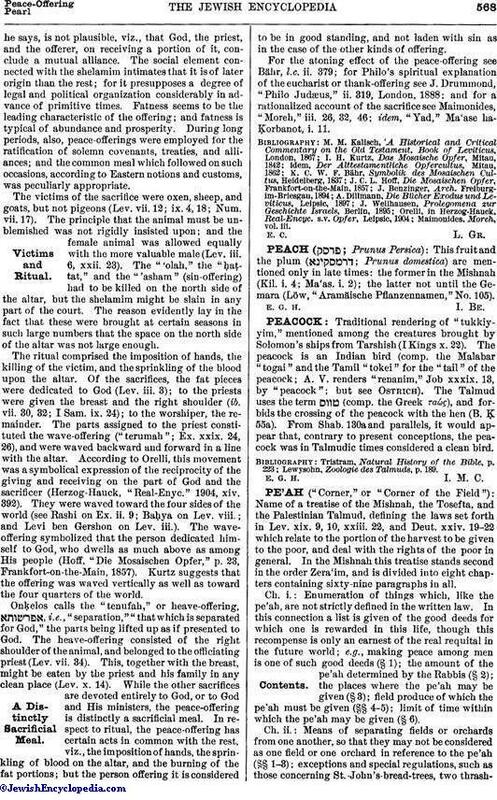 130a and parallels, it would appear that, contrary to present conceptions, the peacock was in Talmudic times considered a clean bird. Lewysohn, Zoologie des Talmuds, p. 189.